Former Olympian Beckie Scott is president and CEO of the Edmonton-based Spirit North program. When she visits communities the children get to try on her Olympic medal. Photos by Spirit North. 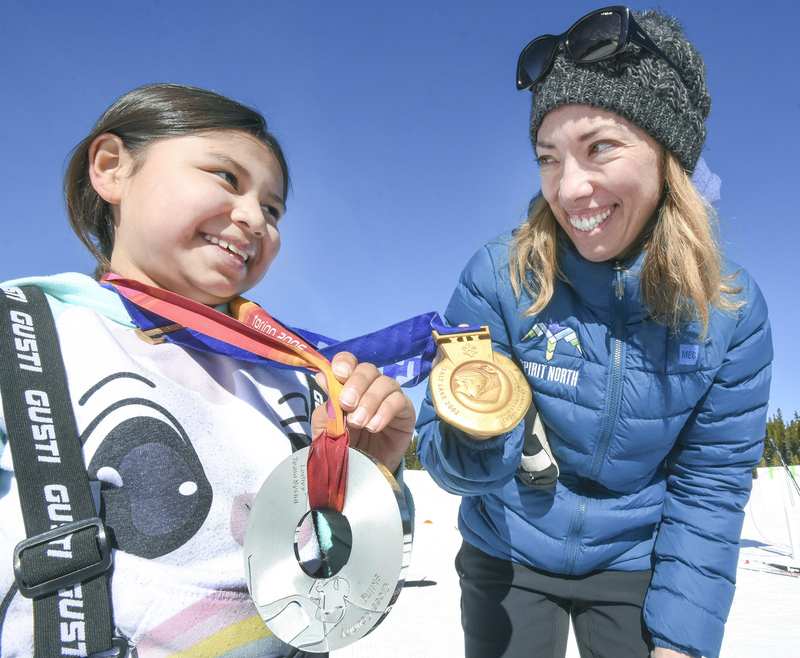 Thanks to a substantial federal grant, a cross-country skiing program headed by former Olympian Beckie Scott is greatly expanding in Indigenous communities in western Canada. Scott, who represented Canada at the 1998, 2002 and 2006 Winter Olympics, is the president and CEO of the Edmonton-based Spirit North program. The program kicked off in 2009 by introducing cross-country skiing to four Indigenous communities in Alberta. Spirit North not only provides an introduction to the sport but also assists in having sustainable cross-cross skiing programs in the locations. Spirit North is now in more than 30 Alberta communities. And for the first time the program expanded outside of the provincial borders in 2018 when it was introduced to three communities in British Columbia. Thanks to a $1.7 million grant from Indigenous Services Canada, which was officially confirmed this past November, Spirit North is expanding once again. Four new communities are being added in B.C. And for the first time expansion will also be taking place into Saskatchewan and Manitoba. Scott is thrilled to see the increasing amount of communities that Spirit North is assisting. “The growth in the last year-and-a-half has been dramatic,” she said. Besides the large federal grant, Spirit North has benefitted lately from the fact it received its charitable status this past August, which has brought in additional donors. “Up until 2017 the growth was slow and steady and easy to manage,” she said. Scott, who tries to get to every new community when the sport is introduced there, does not mind the fact the organization is keeping her busier than ever. In fact, she would love to see it grow much more. Scott, however, is not willing to speculate how long it might take to get Spirit North into all provinces and territories. “It’s all based on what we can do with our funding,” said Scott, who was born in the Alberta town of Vegreville and now lives in Canmore. Spirit North program manager Laura Filipow also believes expansion from coast to coast to coast would be ideal. Thanks to their new funding, said Filipow, Spirit North officials for the most part were able to accommodate those communities who requested to have the program. “We did have to pick and choose a little bit,” Filipow said. The Spirit North program begins with a cross-country ski day introduction in a community. The program offers support via coaching certifications, trail development and leaving behind skis for community members to enjoy. Scott does her best to attend the first session in each new location. “It’s always really inspirational for me to go to these communities,” she said. Scott herself is inspiring, having participated at the Nagano, Salt Lake City and Turin Olympics. Highlights of her career included winning two Olympic medals. For starters, she was originally awarded a bronze medal at the 2002 Winter Olympics in Salt Lake City in her five-kilometre pursuit event. She was eventually awarded the gold medal in that race when the two Russian competitors who had finished ahead of her were stripped of their medals after testing positive in drug tests. Scott also ended up winning a silver medal in the team sprint event at the 2006 Turin Olympics in Italy. Scott always brings her Olympic hardware with her whenever she visits Spirit North communities now. Since her last Olympic appearance was 13 years ago, Scott said many of the Indigenous youth in communities do not know who she is. But many of the adults in those communities are aware of her past Olympic participation. Youngsters in the program always get a kick when they are offered the opportunity to wear an Olympic medal. Besides being the Spirit North president and CEO, Scott is also the chair of the athlete committee for the World Anti-Doping Agency.